Looking back at my recent (and infrequent - sorry about that) reviews, it seems I've been into chocolate bars lately. Trying different chocolate brands and types is one of my favorite things about running this blog; I love looking for little differences in flavor and texture. Vosges is not a brand I buy often, simply because it's expensive. This bar, for example, was $5.99. Despite the price, when I went on a recent chocolate buying spree (seems like this happens a lot these days), the Black Salt Caramel bar called out to me. 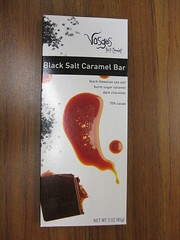 The Bapchi's Caramel Toffee bar I tried last year was so delicious, I thought another caramel bar from Vosges would be a sure bet. If you were wondering, the unbroken bar looks like this, but it was important for me to show you how this bar broke, because it completely dominated my overall impression of the bar. It was such a mess, even by caramel standards! The bar just wouldn't break at the "perforations" for me. 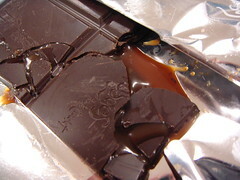 The chocolate just kept cracking, leaving an oozy, sticky pile of caramel I had to lick off the wrapper (I'm not ashamed). Maybe it's just because I'm very neat, but this really bothered me. The bar didn't have a strong scent, just a mild hint of cocoa. The 70% cocoa chocolate was slightly bitter, but it had a dreamily smooth melt. 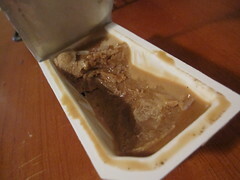 The runny liquid caramel was intensely sweet, but it did carry a hint of salt along with a toasty, slightly earthy flavor. The caramel really needed the dark chocolate to balance the bite, but since the caramel kept leaking out, that goal was hard to accomplish. When I did manage to keep it together, the bites along the borders of the pre-formed squares were more appealing; bites from the middle were just too sweet because there wasn't enough chocolate to offset the caramel. 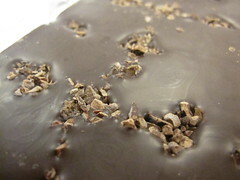 Vosges does dark chocolate very well, but I could have done with less caramel. Don't eat this bar in the car, or at least try to have a moist towelette on hand if you do. This review is based on the entire consumption experience - if the bar hadn't been so messy, I would have rated it higher based on flavor alone, but as much as it pains me, I've got to account for my frustration. I still love you, Vosges! Please read other reviews at The Candy Enthusiast and The District Chocoholic for some different perspectives on this bar. I just might have a new favorite chocolate brand. It's not cheap at $5.99 a bar (I bought both of these myself), but Madecasse Chocolate is worth the investment. It's single origin chocolate from Madagascar, but beyond that, they pay above fair trade prices and provide equipment and training to their cocoa farmers. Oh, and it's delicious. 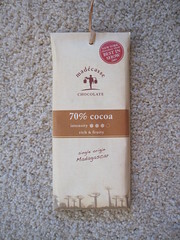 The two bars I've tried are the 70% Cocoa and the Sea Salt & Nibs (63% cocoa). My friends and family have had to put up with me raving about this brand for several days now (but it's worth it because I share). I'm not a chocolate connoisseur, but it's not often that a bar impresses me this much. The first bar I tried was the 70% Cocoa. The understated packaging was beautiful, and according to the back of the wrapper, the little straw tie was hand-tied in Madagascar. 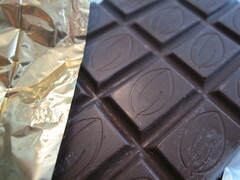 Inside, the bar was wrapped in pale gold foil (and I do love shiny things), and the chocolate itself was a lovely shade. It broke cleanly along the perforations with a nice snap. The chocolate was had a deep and varied flavor; strongly fruity, but not acidic. 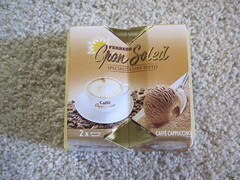 I often enjoy chocolate at around 70%, and this was no exception. It was certainly bitter, but still silky smooth on the tongue. 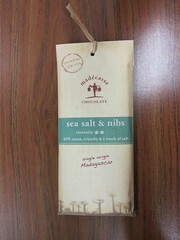 The packaging and look of Sea Salt & Nibs was similar, but the back of the bar was just beautiful. It smelled quite bitter, but the flavor was fruity and bright. The cacao nibs added a fantastic crunch and a strong, bitter bite on the tongue, but overall, it was sweeter at 63% cocoa. The sea salt was there to bring out the slight sweetness of the chocolate, and it was just right - not too strong but not absent. While I prefer the plain dark chocolate, it's nice to have a bit of texture variety. I was thrilled with both of these bars, and looking back at old reviews, I've got to give both my top rating. Review blogging is subjective by nature, and it all depends how I feel about a product at the time. It usually takes multiple tastes over several days, but it's really just for fun.